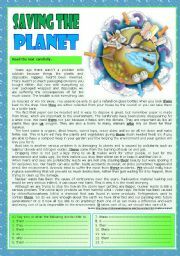 This is an intermediate ws on environmental problems. It has got a text, three tasks on vocabulary (two on the first page and another on the second - about problems and solutions - and questions about the text. I hope you like it! Many hugs! 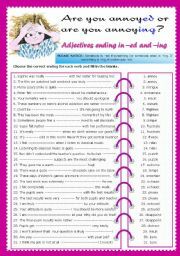 This is a worksheet on ing- and -ed ending adjectives similar to another I have recently uploaded. 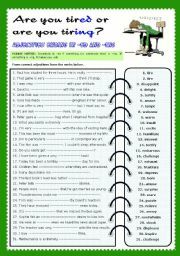 It contains 31 sentences to be completed with the correct ending. 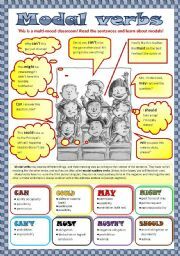 Pupils have to form the adjective from the verb given on the right side of the worksheet. Have a great Monday! 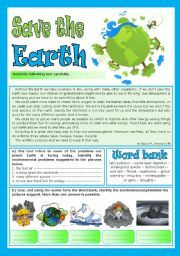 A text about environmental problems, some of its causes and consequences. It is followed by several reading comprehension tasks. Hugs! It is an elementary worksheet I created for my younger students (for the 1st time in my life I have really young learners - nine/ten-year olds!). 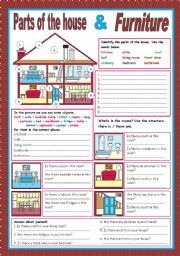 We are studying vocabulary related to the topic "house" and also the verb "there to be", and so this worksheet focuses on those areas. I hope you find it useful! An interesting text that draws our attention to the dangers of wireless technologies. It is followed by several tasks: reference words, equivalent matching, true / false, questions about the text and some topics for discussion. Have a great week! On the first page pupils can read many sentences with different modals and elicit some rules about them. 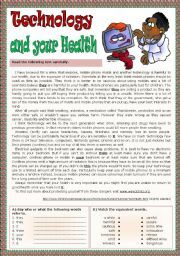 Then there is a grammar-guide with clear explanation on this grammatical content. On the second page there are four types of exercises. An answer key is provided. Be happy! It contains explanation and exercises on the imperative. Have a great Tuesday! 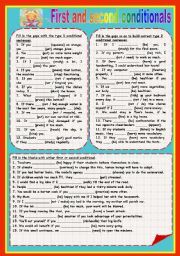 An elementary worksheet on Present Continuous Tense. Students should match the pictures to the sentences, by writing the correct number next to the sentences. Have a wonderful weekend! This ws has got 31 sentences to fill in with adjectives ending in -ed or -ing. Have an amazing day! A step-by-step grammar guide with clear explanations on Passive Voice using the Present Simple Tense (all forms). These powerpoint slides are animated so you can explain this topic gradually and eliciting students� participation. It worked perfectly for my 8th graders!